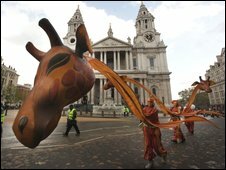 Thousands of people gathered in central London to watch the Lord Mayor's Show. 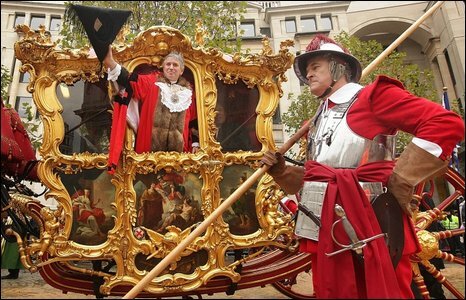 The 682nd Lord Mayor, Nick Anstee, travelled in a 252-year-old gold coach on a procession through the Square Mile up to the Royal Courts of Justice. He stopped first at St Paul's Cathedral before pledging allegiance to the Crown at the Royal Courts. He said he wants to "recover the trust" in the City which has been "damaged". Plans for fireworks on the River Thames have been cancelled due to bad weather. Mr Anstee, a chartered accountant who has lived and worked in the Square Mile for 32 years, said: "The City of London is a brand in its own right. "Many have observed that over the past 18 months the brand has actually been damaged. "There is an element of mistrust of the financial services industry and to help recover that trust is a very important part of what I am seeking to do over the next 12 months." An RAF flypast opened the show which included various street performances and floats from schoolchildren and livery companies in the City. A total of 6,100 people participated in the show, including 2,000 servicemen and women. A fireworks display on the River Thames was cancelled by the Port of London Authority due to bad weather. This was the first time in more than 20 years the display had been called off. A spokeswoman said: "There are high winds in London already and they are forecast to get worse in terms of wind speed." In 1215 King John granted a charter allowing the City to elect its own mayor and since then the Lord Mayor has made his journey every year. The annually-elected Lord Mayor is the head of the City of London Corporation and acts as global ambassador for the whole UK-based financial services industry.